Club Penguin Cheats by Mimo777 Club Penguin Cheats by Mimo777: Club Penguin Christmas Party FREE item... Sweet Treat Background! 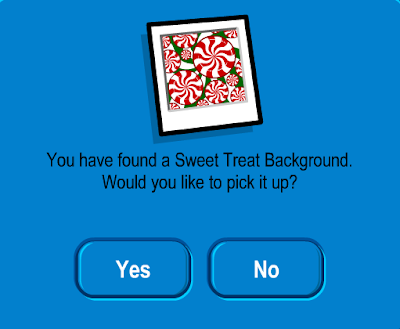 Club Penguin Christmas Party FREE item... Sweet Treat Background! The December 21st new Club Penguin FREE item from the 12 Days of Free Gifts in the Forest is here! Now this is a sweet background! Am I right? CPG moderator is the penguins who watch over this site and who answer questions. And they sometimes go on Club Penguin and get the latest cheats for mimo. this is how u get all the christmas iteams before 25 december u change the date on your computer to 25 december there you go to the forest and have it all.